Background: The emergence of drug-resistant mycobacteria becomes a significant public health problem globally creating an obstacle to effective tuberculosis (TB) control. Gujarat, Maharashtra, and Andhra Pradesh DRS survey estimated that the proportion of multidrug-resistant TB (MDR-TB) is 2.1% (in new TB cases) and 15% (in previously treated cases). Programmatic management of MDR-TB implemented under Revised National Tuberculosis Control Programme in India in 2007. Objectives: The objective of this study is to evaluate treatment outcome and adverse drug reactions (ADRs) of category IV. Materials and Methods: A total of 108 MDR-TB patients were analyzed retrospectively who registered and received treatment during the year of 2014 and 2015 at district TB centre, Rajkot. MDR patients who died or transferred out or defaulter before completion of intensive phase were excluded from the analysis. Results: Of total 108 patients majority patients (64.81%) were in young (20–39 years) with m:f: 2:1. All MDR-TB patients were retreated cases and 69.44% were “undernutrition category”. Culture conversion rate was 86.91% at 4 months of treatment. Cure rate was 50.93% while defaulter rate and died rate was same (17.59%). Failure rate was 18.51%. Weight improvement was significantly associated with cure rate. The incidence of ADR was 32.71%. Most frequent ADRs were related to gastrointestinal system (34.42%), ototoxicity (13.11%), and central nervous system (8.1%). Aminoglycosides, cycloserine, and ethambutol were discontinued due to ADR. Majority ADRs (77.04%) were “possible” category by causality assessment and “mild” in severity assessment. Ototoxicity was only severe ADRs observed. Conclusion: Cure rate was improved than previous years at same center. Attention should be paid for defaulters. In 1999, the Green Light Committee, a partner of the World Health Organization (WHO), launched the “directly observed treatment (DOTS)-plus short-course program for MDR-TB patients. Programmatic management of MDR-TB implemented under the Revised National Tuberculosis Control Programme (RNTCP) in India in 2007., The present study was performed to evaluate the treatment outcome and adverse drug reaction (ADR) of DOT plus regimen in MDR-TB patients at Rajkot district TB centre (DTC). This was a retrospective study approved by the Institutional Ethics Committee of Civil Hospital and prior permission of DTC Rajkot. All patients diagnosed and treated for MDR-TB (except pregnant patients) under Category IV regimen of the RNTCP from DTC Rajkot were included from January 2014 to December 2015. MDR patients who died or transferred out or defaulter before completion of intensive phase were excluded from analysis. Data collection was carried out by obtaining information from treatment cards. The baseline data of treatments of patients were recorded in case record form. Treatment outcome was categorized as cured, defaulted, failure and death as per the RNTCP guidelines. A patient was declared cured after complete treatment for at least 24 months with last five cultures negative. However, patient having two or more of last five cultures positive was considered as failure. A patient who interrupted treatment for two or more consecutive months was labeled as defaulter. ADRs of DOT Plus regimen were evaluated for causality, severity and preventability assessment. Data were entered into Microsoft Excel and evaluated with appropriate statistical test. A total of 108 MDR-TB patients (confirmed by drug sensitivity testing) were enrolled as per inclusion. All the patients received second-line antitubercular drugs (kanamycin [Km], ofloxacin [Ofx] or levofloxacin [Lvx], ethionamide [Eto], pyrazinamide [Z], ethambutol [E], and cycloserine [Cs]) on weight basis as per the DOTS-plus program. Out of 108 patients, majority patients (64.81%) were belonging to young (20–39 years) age group with mean age 32.83 ± 11.48. All MDR patients were retreated cases except single case that had infection with resistant strain. According to body mass index (BMI), most of the MDR-TB patients 75 (69.44%) were in “undernutrition (BMI <18.5)” category and 57.41% patients had below 45 kg weight at the start of treatment. A total of 60 ADRs were reported among 35 MDR-TB patients. Very few patients (10.19%) had comorbidity with TB. 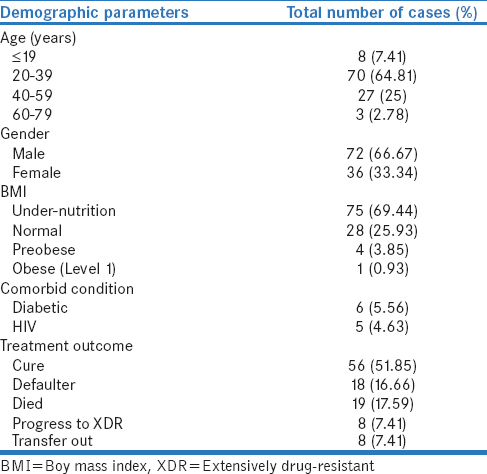 Cure rate was 50.93% and 7.41% were progressed to extensive drug-resistant (XDR) [Table 1]. Overall culture conversion rate was 86.91% of which 69.15% at first 4 months and 13.74% at 8 months of treatment. Sputum culture reversal rate was 28.03%. The overall incidence of ADR in our study was 32.71% in this study. Majority of ADRs were weakness (37.70%), gastrointestinal tract related (37.20%), and central nervous system (CNS) related (8.1%) [Table 2]. Para-aminosalicylic acid (PAS) and ethambutol were causal drugs for weakness and gastrointestinal (GI) side effects, aminoglycosides, and capreomycine were for hearing lose and pyrazinamide was for joint pain in this study. In few cases, causative drugs were not mentioned. Majority ADRs were managed symptomatically while permanent discontinuation of drugs was required in 7 patients (12 [19.67%] ADR events). Cycloserine (CNS ADRs), kanamycin, and capreomycin (ototoxicity) drugs were withdrawn from treatment regimen [Table 3]. Majority ADRs were “possible” category by the WHO causality assessment and “mild” in severity as per modified Hartwig and Siegel scale. Ototoxicity was only severe ADRs observed in this study. Forty-one (67%) ADRs in this study were “not preventable” as per Schumock and Thornton Preventability criteria [Table 4]. Younger population (20–39 years), lower BMI (undernutrition - 69%), and male gender were more affected in this study. Other studies also show same results with preponderance of reproductive age group, undernutrition, and male gender, in MDR-TB patients. Younger population is vulnerable because of economic responsibility and environmental exposure to resistant strain, and they are more prone to addiction such as smoking, alcohol intake, and psychological stress which results in the weakening of immunity. In a developing country like India, malnutrition is a major health problem and very important factor which leads to poor immunity and so associated with adverse outcome. Due to an increased awareness of health and care-seeking tendency of male might account for higher numbers as compared to females in the study. Very few patients had addiction during disease history. Good cure rate (50.93%) was observed in this study which was slightly higher (47.2%) than previous reports [Figure 1] of 3 years at same center. Similar cure rate (44%–53%) was obtained in other countries such as south Korea, China, and Taiwan., Higher cure rate (61%–77%) in MDR-TB patients was reported in studies done at New Delhi and Nepal.,,, Defaulter rate and died rate were same (17.59%) and failure rate was 18.51% in this study. Reason for defaulter might be complex regimens with less efficacious drugs for very long (≥20 months) period, frequency of ADRs, migration of patients at out of stat lack of education and awareness among patients. Defaulters are potentially harmful to the community as they are source for spreading resistant bacteria and they may progress to XDR cases. There was no significant association of age, gender, BMI, new or retreated with treatment outcome in this study. Mean weight gain at the end of treatment was 5.93 kg and was observed in 60.18% of patients while 12.03% shows no improvement and 19.44% shows a reduction of weight. Cure rate was higher (75.38%) in patients who show weight improvement which was statistically significant. Among sociodemographic parameters, weight improvement was significantly associated with successful treatment outcome in this study. Overall incidence of ADR in our study was 32.40%. Most common ADRs were related to GI system, ototoxicity and CNS. Similar ADR profile was observed in other studies done by Yew et al., Thomas et al. and Törün et al.,, All GI track-related ADRS were “possible” by causality and “mild” in severity. All GI-related ADRS were managed symptomatically, but two cases required discontinuation of ethambutol. 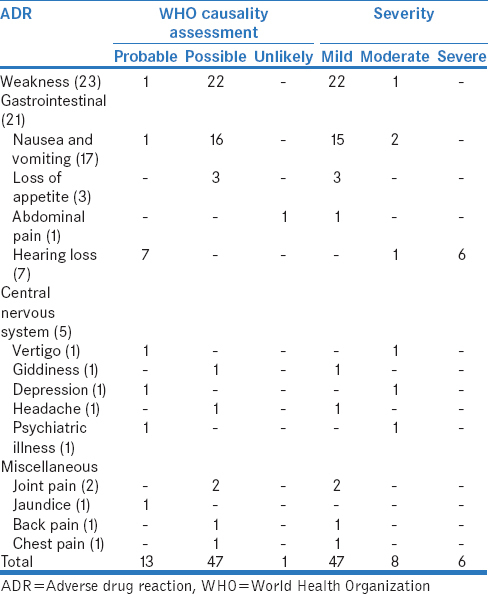 Second most ADR was ototoxicity which was “probable” and “severe” in nature. All patients of ototoxicity were required to discontinue aminoglycoside. Patients with psychiatric ADRs required withdrawal of cycloserine which was replaced with PAS. Two patients had severe joint pain and so needed to discontinue pyrazinamide. Precautions for expected ADR of second-line antituberclular drugs should be evaluated individually before enrolment. Cure rate in MDR-TB was improved, and failure rate was reduced as compared to previous year reports at the same center. Attention should be paid for reduction of defaulter rate and will have impact on improving treatment outcome. As this is a retrospective study, we were able to analyze the available data within treatment card. Underreporting of ADR as well reporting bias is possible. Data regarding other comorbidity, radiological correlation, risk factors/predictor for unsuccessful outcome could not analyzed. We would like to acknowledge Dr. S. G. Lakkad, Rajkot DTC centre Officer, Mr. Maheshbhai (Drug resistance and TB-HIV cocoordinator) for their cooperation and guidance for successfully conducting the study. Brode SK, Varadi R, McNamee J, Malek N, Stewart S, Jamieson FB, et al. Multidrug-resistant tuberculosis: Treatment and outcomes of 93 patients. Can Respir J 2015;22:97-102. Johnston JC, Shahidi NC, Sadatsafavi M, Fitzgerald JM. Treatment outcomes of multidrug-resistant tuberculosis: A systematic review and meta-analysis. PLoS One 2009;4:e6914. World Health Organization. Global Tuberculosis Control: WHO Report 2012. WHO/HTM/TB/2012.6. Geneva, Switzerland: WHO; 2012. Available from: http://www.who.int/tb. [Last accessed on 2017 Oct 09]. World Health Organization. Global Tuberculosis Report 2012. Available from: http://www.who.int/tb/publications/global_report/en/. [Last accessed on 2017 Nov 15]. Langlois-Klassen D, Wooldrage KM, Manfreda J, Sutherland K, Ellis E, Phypers M, et al. Piecing the puzzle together: Foreign-born tuberculosis in an immigrant-receiving country. Eur Respir J 2011;38:895-902. World Health Organization. The Global MDR-TB & XDR-TB Respons Plan 2006-2007. Geneva: World Health Organization; 2007. Available from: http://www.who.int/tb/publications/2007/en/index.html. [Last accessed on 2017 Aug 12]. Joseph P, Desai VB, Mohan NS, Fredrick JS, Ramachandran R, Raman B, et al. Outcome of standardized treatment for patients with MDR-TB from Tamil Nadu, India. Indian J Med Res 2011;133:529-34. Rathod KB, Borkar MS, Lamb AR, Suryavanshi SL, Surwade GA, Pandey VR. Adverse events among patients of multi drug resistant tuberculosis receiving second line anti TB treatment. Int J Sci Rep 2015;1:253-7. 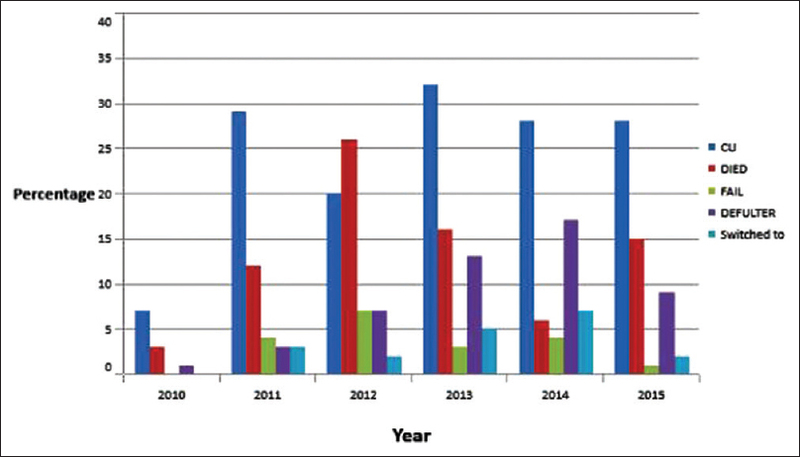 Bhatt G, Vyas S, Trivedil K. An epidemiological study of multi drug resistant tuberculosis cases registered under revised national tuberculosis control programme of Ahmedabad city. Indian J Tuberc 2012;59:18-27. Kapadia VK, Tripathi SB. Adverse drug reactions and outcome analysis of MDR TB patients on DOTS plus regimen. Natl J Community Med 2015;7:5-9. Horne N. Tuberculosis and other mycobacterial disease. In: Cook G, editor. Manson′s Tropical Diseases. London: W.B. Saunders; 1996. p. 971-1015. Kuldeep R, Mishra VK, Gour N, Gupta RC, Gupta P. A study to assess socio demographic correlates of multi drug resistant (MDR) TB cases in a tertiary care hospital of India. J Med Sci Clin Res 2015;3:8554. Singla R, Sarin R, Khalid UK, Mathuria K, Singla N, Jaiswal A, et al. Seven-year DOTS-plus pilot experience in India: Results, constraints and issues. Int J Tuberc Lung Dis 2009;13:976-81. Van Deun A, Salim MA, Das AP, Bastian I, Portaels F. Results of a standardised regimen for multidrug-resistant tuberculosis in Bangladesh. Int J Tuberc Lung Dis 2004;8:560-7. Dela AI, Tank NKD, Singh AP, Piparva KG. Adverse drug reactions and treatment outcome analysis of DOTS-plus therapy of MDR-TB patients at district tuberculosis centre: A four year retrospective study. Lung India 2017;34:522-6. Shin SS, Pasechnikov AD, Gelmanova IY, Peremitin GG, Strelis AK, Mishustin S, et al. Treatment outcomes in an integrated civilian and prison MDR-TB treatment program in Russia. Int J Tuberc Lung Dis 2006;10:402-8. Chiang CY, Enarson DA, Yu MC, Bai KJ, Huang RM, Hsu CJ, et al. Outcome of pulmonary multidrug-resistant tuberculosis: A 6-yr follow-up study. Eur Respir J 2006;28:980-5. Park SK, Lee WC, Lee DH, Mitnick CD, Han L, Seung KJ, et al. Self-administered, standardized regimens for multidrug-resistant tuberculosis in South Korea. Int J Tuberc Lung Dis 2004;8:361-8. Liu CH, Li L, Chen Z, Wang Q, Hu YL, Zhu B, et al. Characteristics and treatment outcomes of patients with MDR and XDR tuberculosis in a TB referral hospital in Beijing: A 13-year experience. PLoS One 2011;6:e19399. Jain K, Desai M, Solanki R, Dikshit RK. Treatment outcome of standardized regimen in patients with multidrug resistant tuberculosis. J Pharmacol Pharmacother 2014;5:145-9. Törün T, Güngör G, Ozmen I, Bölükbaşi Y, Maden E, Biçakçi B, et al. Side effects associated with the treatment of multidrug-resistant tuberculosis. Int J Tuberc Lung Dis 2005;9:1373-7. Thomas A, Ramachandran R, Rehaman F, Jaggarajamma K, Santha T, Selvakumar N, et al. Management of multi drug resistance tuberculosis in the field: Tuberculosis research centre experience. Indian J Tuberc 2007;54:117-24. Yew WW, Chan CK, Chau CH, Tam CM, Leung CC, Wong PC, et al. Outcomes of patients with multidrug-resistant pulmonary tuberculosis treated with ofloxacin/levofloxacin-containing regimens. Chest 2000;117:744-51.